My latest commission was a wonderful project recreating a family tree, and a childhood memory, all in one very tall painting. We had the unique idea of painting Donna’s tree so it stood alone on the canvas, having her grandparents at the bottom of the painting, and the tree shrouded in the Oregon mist at the top. Dims would be 12x48”. We started with several watercolor sketches for approval, before I completed it in acrylic. The most challenging part of the painting was capturing her sweet grandparents in such small detail while keeping the tree the main focus. I LOVED working on this project, it seemed to have a very whimsical feel about it, I was honoring both the legacy of her grandparents and the beauty is the towering Douglas fir, all while offering them a view their family had never seen. I have wanted to complete this Kolob commission for over 20 years. I was first asked to paint the Kolob Five Fingers by my cousin Joe after I graduated from SUU with my illustration degree. This view of the Five Fingers can only be seen from New Harmony Utah. Our family had property there, and it was a special place for all us. After graduation, I spent my time traveling, settling down and working, not as full time artist, but always painting when I could. I painted several small watercolor sketches of this scene, studying each rock formation. I grew to love each "finger" and know them by heart. Still, I never had the time to dedicate to this majestic land-scape, putting it off for another day. That changed the summer of 2017. I finally took the leap and left the beloved design company that I had worked with for decades. With the knowledge I had gained from my former employer, and an amazing support system at home, I began work as a full time free-lance painter. I contacted my patient cousin, who has since started his own business as a cabin builder. He was more than happy to see his request finally fulfilled. I started with a 6.5x3.5 foot canvas and began work. I used acrylic paints, giving me more freedom with drying times and layered blends. It took 2 easels to support the large canvas. 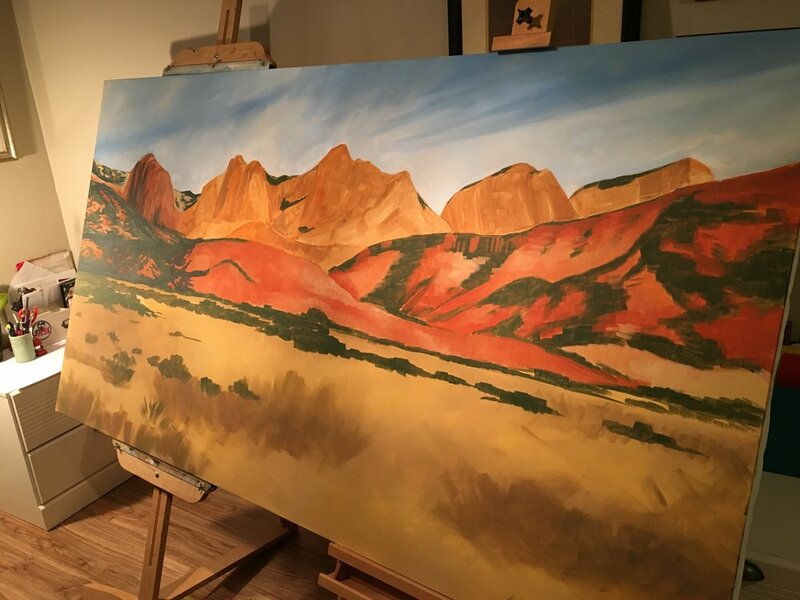 I started with the red rock, painting in the darks and working to the highlights. Red rock is always a challenge, each cliff has it's own unique shape and lighting. The foreground of grass and sagebrush were painted last, the small fence line completing the painting. It was a joy to finally deliver the completed commission to Joe. After 20 years, the painting we had envisioned now hangs high above the large pine cabin logs. The wait was worth it (I hope). I had a great time painting this mural for Ken Garff Customs. I was commissioned to paint one of their custom Jeeps in action. The mural was a 12x10 foot wall. I started by penciling in the jeep and slowly adding a wash over the entire wall. The details went slower, but worth the wait. I'm happy with the final product. It was so fun to paint Mason and his cute pup Brookes for this very Halloween inspired painting.